The Hawaii Superferry has yet to unite the islands by water, but it is succeeding in bringing together a diverse collection of farmers, environmentalists, teachers, students, surfers and other individuals in an effort to force an environmental review. That is the makeup of the groups now opposing the Superferry in the courts. "It's a wide-ranging group. You can't really stereotype them," said Kauai Councilwoman and former Mayor JoAnn Yukimura. "They range from surfers and construction workers, a lot of local and native Hawaiian people who have lived here all their lives, and also a lot of people who have lived here maybe two months to five years. "At harbor on Sunday, I was there. I saw lawyers, I saw doctoral students, I saw radio personalities, environmentalists, native Hawaiians, people who live in Nawiliwili area and people from North Shore and West Side," Yukimura said. 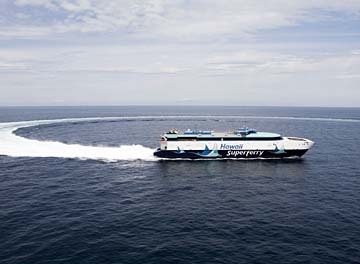 Members of the Kauai and Maui groups at the forefront of the Superferry battle do not consider themselves newcomers or fringe elements. "Concern for the Superferry is deep, and it's wide," Jeff Mikulina, executive director of the state Sierra Club chapter, said yesterday. "We've been reminded of that by seeing the diversity of individuals involved." The Sierra Club, a nationwide conservation organization that has had a Hawaii chapter for 40 years, has 800 members on Maui, said Lucienne DeNaie, who is a Maui group member and vice president of the state chapter. Co-plaintiffs in the Maui court cases are the watchdog group Maui Tomorrow and a loosely organized hui called the Kahului Harbor Coalition. During the years, the Maui Sierra Club's board has consisted of farmers, retired business people and others, including lifelong Maui residents and more recent arrivals, DeNaie said, including "a cross section of different backgrounds, ethnicities and ages." Maui Tomorrow, a nonprofit organization formed to seek a state park at Makena, has become an advocate for protection of Maui's natural areas and open space and for "ecologically sound development," it says on its Web site. It claims to have 1,000 members. Jeff Parker, a Maui orchid farmer who is spokesman for the Kahului Harbor Coalition, said many farmers in his group are concerned about adequate inspection of plants that move between islands, to prevent the spread of invasive pests. The informal coalition includes small businesses that use the harbor regularly and Hawaiian outrigger canoe paddlers who use Kahului Bay for practice and regattas. Parker and DeNaie, who also is a board member of Maui Tomorrow, said none of the three organizations have taken any financial or other contributions from interisland shipping companies, airlines or rental car companies. Through individual contributions the three Maui groups have raised $30,000 of the $50,000 legal bill they had a week ago, DeNaie said. Jimmy Trujillo, an eight-year resident of Kauai and part of the Hui R group that planned protests at Kauai's Nawiliwili Harbor, laughed when he heard of allegations that they are funded by interisland shipping companies, airlines and rental car companies. "We've got no budget, no structure, no hierarchy, and you should see the junk-a-lunk I drive," said the community college lecturer. Individuals chipped in to rent a community hall to hold an organizing meeting, Trujillo said, but there are no corporate sponsors. Yukimura, Kauai state Sen. Gary Hooser and Rep. Mina Morita agreed that the Kauai protesters are by definition "grass-root." People think an environmental impact statement "is for wildlife and bugs," and it can be, said Karen Chun, a Maui canoe paddler. "But it's also for when you find out you have problems like paddlers being pushed out of the harbor (by security zones) or the traffic problem" cars from the Superferry could cause, she said. A hearing originally set for today before Maui Circuit Judge Joseph Cardoza, on a request for a preliminary injunction to prevent the Superferry from docking at Kahului Harbor until an environmental assessment is completed, has been rescheduled for Monday, according to a state Judiciary news release. All parties agreed to the switch, the release said. State law (Hawaii Revised Statutes, Chapter 343) requires an environmental review of "any project or action that may affect the environment." An Environmental Assessment is prepared for projects that are expected to have no significant environmental impact. Once a draft of the assessment is complete, the public has 30 days to comment on it, and the agency preparing the assessment must respond to public comment. If there is a "finding of no significant impact" in the final assessment, there is a 30-day period when legal challenges can be filed. Once the finding of no significant impact is adopted and if the assessment survives possible legal challenges, the project can go ahead. An Environmental Assessment can take months to prepare. If it is determined that a project is likely to have a significant environmental impact, a more in-depth Environmental Impact Statement must be prepared. The EIS must completely disclose the likely impacts of a project and measures to mitigate them. There is a 45-day period for public comment after a draft EIS is prepared, and the agency preparing the EIS must respond to public comments. Once a final EIS is accepted, there is a 60-day period for legal challenges before a project can be approved. An EIS can take months and sometimes years to prepare. More on the EA-EIS process can be found at www.state.hi.us/health/oeqc/notice/ index.html.